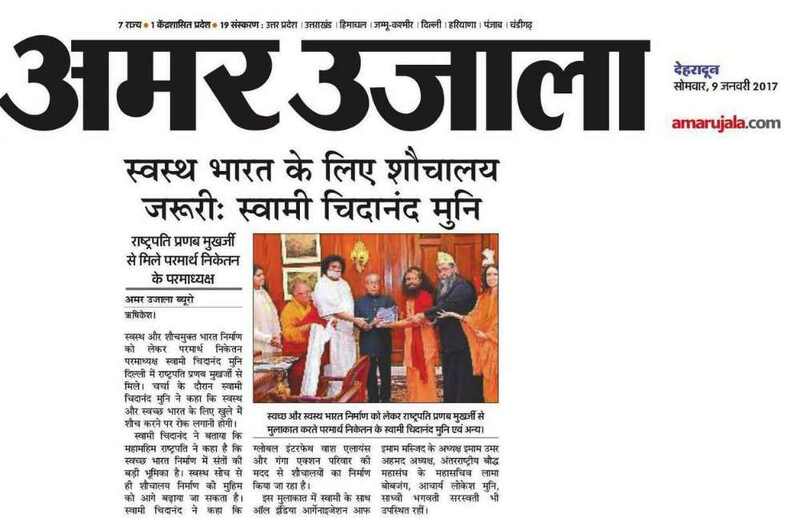 Hon’ble President of India, Shri Pranab Mukherjeeji was presented the Global Interfaith WASH Alliance’s (GIWA) first edition of “WASH in Sikhism” and “WASH in Buddhism” books* recently by GIWA’s Co-Founder Pujya Swamiji, and GIWA’s interfaith leaders and representatives, including: Imam Umer Ahmed Ilyasiiji, President, All India Organization of Imams of Mosques, Venerable Lama Lobzangji, Secretary General, International Buddhist Confederation, President, Asoka Mission, India, Acharya Dr. Lokesh Muniji, President-Founder of the Ahimsa Vishwa Bharti, Sadhvi Bhagawati Saraswatiji, Secretary- General, Global Interfaith WASH Alliance, President, Divine Shakti Foundation, Sardar Paramjit Singh Chandhokji, Chairman of Delhi Sikh Gurudwara Committee, Sardar Kuldeep Singh Bhogalji, National Organising Secretary, Shiromani Akali Dal, Swamini Adityananda Saraswatiji, Director of Programmes, Policy and Development, Global Interfaith WASH Alliance and Ganga Action Parivar, Nandini Tripathi, Director of Programme Implementation. GIWA and GAP GIWA’s interfaith leaders shared with Hon’ble Shri Pranab Mukherjeeji that this special meeting concluded a five day, intense and incredible tour in which GIWA’s faith leaders spent the first three days in Patna, Bihar, during the auspicious occasion of the Prakash Parv, the 350th Birth Anniversary of Sri Guru Gobin Singhji, where they presented the preview of “WASH in Sikhism” to Chief Jathedar Giani Gurbachan Singhji of Akal Thakt (Golden Temple) and to Jathedar Giani Iqbal Singhji of Patna Saheb, both of who blessed and offered their support to the vital initiative. 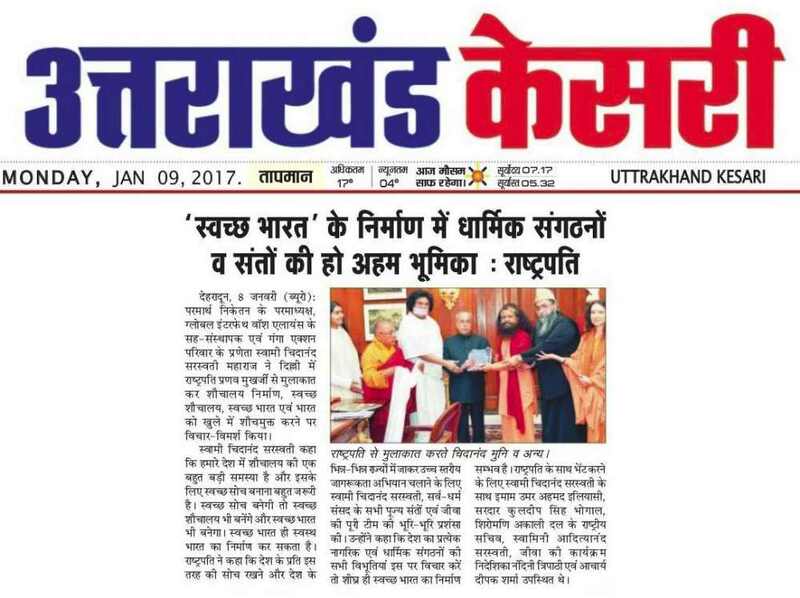 On the 4th January, they presented both editions of the “WASH in Sikhism” and “WASH in Buddhism” to the Hon’ble Governor of Bihar, Shri Ram Nath Kovindji, during a beautiful Sarva Dharma Swachhta Evam Sadbhavana Sankalp. On the 5th January, they also met with Hon’ble Chief Minister of Bihar, Shri Nitish Kumarji and shared both editions with him, discussing ways to make Bihar completely open defecation free and ensuring a clean and free-flowing River Ganga in Bihar. On the 6th January, they presented the preview edition of “WASH in Buddhism” in a large public programme with and to His Holiness the Dalai Lama, during the ongoing Kalchakra Puja and Initiation ceremony in Bodh Gaya, Bihar. 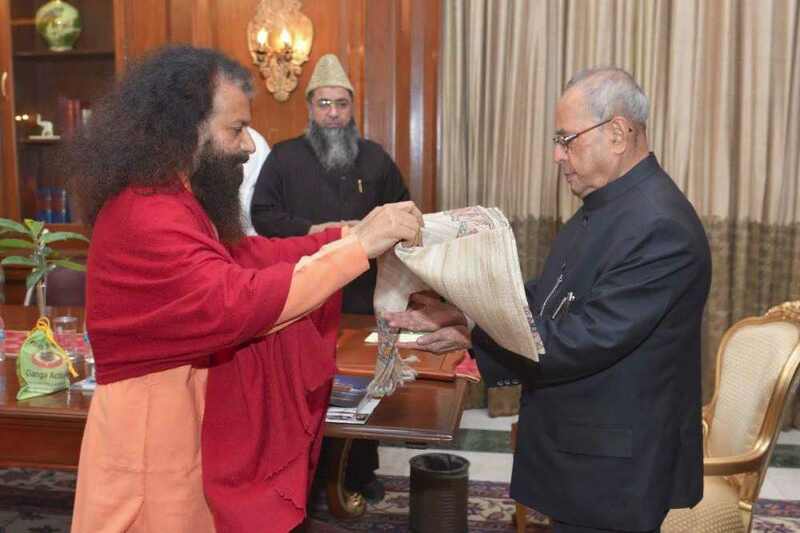 They also shared the importance of interfaith harmony to promote a Swachh and Swasth Bharat (Clean and Healthy India). GIWA’s faith leaders shared about the World Toilet College and the various activities being undertaken by GIWA to improve WASH for all.